Abdel Fattah Al-Sisi becomes the next Egyptian president, citing 'people's revolution.' But was the election fair? Egypt’s former defense minister Abdel Fatah Al-Sisi was officially sworn in as President on Sunday, after winning by a landslide 96% vote in last month's elections. He will rule for a four-year term. 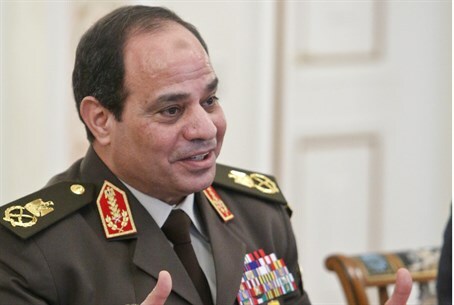 “I swear by Almighty God to loyally uphold the republican system, to respect the Constitution and the law, to fully uphold the interests of the people and to safeguard the independence and territorial integrity of the nation,” Al-Sisi stated, before a cheering crowd. Analysts have expressed hope that Sisi will bring a climate of change to Egypt, which is still reeling for ongoing political turmoil since the 2011 "Arab Spring" and 2012 ouster of Mohammed Morsi. And it was the very spirit of revolution that politicians at the ceremony seemed to draw upon, according to the Wall Street Journal. "The revolution fell in the grip of a group that ripped it all off. It ripped off the nation's body," Maher Sami, deputy head of the supreme court, who stated at the inauguration. "June 30 wasn't a military coup, but a people's revolution." However, observers at the scene noted that the elections were "not conducted in the spirit of democracy." Last week, Gulf News reported that the Egyptian election commission said that Sisi had gained 23.7 million, or 96.1 percent of the valid votes cast in the polls, Egypt’s first since the army ousted Islamist president Mohammed Morsi last July. Sisi’s sole challenger, Hamdeen Sabahi, secured 757,511 or 3.9 percent of the valid votes. Shortly after results were announced, Sabahi lamented the blow to democracy. "We cannot give any credibility or ratification to the announced numbers of turnout or results," Sabahi stated. "The announced results are an insult to the intelligence of the Egyptians." Testimony from European Union (EU) and African Union (AU) supporters bolstered a sense of mistrust in the election results, with many saying the vote had been rigged from the outset. “It is not as simple as fraud, as someone making fake ballots, that is not what we saw. What we saw was elderly people appearing at polling booths because they were frightened that if they didn’t vote Sisi they would be fined. We saw an environment where people felt they had no choice but to vote for Sisi,” an AU observer told social media site Buzzfeed last month, on condition of anonymity. “We could not count with, or move with, the ballots at every stage. So we don’t have anything to say regarding the turnout numbers. What we can say is that those who voted felt that they had no choice but to elect Sisi," the observer added.